Driving along the main street of flat, sleepy Guadalupe—population less than 8,000, according to the most recent census reports—there’s little evidence that gilded chariots driven by film extras once raced up and down the town’s thoroughfare. And walking along the timeless stretches of sand Guadalupe boasts of in its motto, “Gateway to the dunes,” you could be forgiven for overlooking the mammoth pharaoh heads and sphinxes sleeping in their bed of sand. CAPTURING THE EXODUS: The exodus scene in The Ten Commandments called for more than 2,000 extras and 3,000 animals, many of which were hired from the local area. But if Indiana Jones has taught us anything, it’s that things aren’t always what they seem, and historic treasures can turn up in the unlikeliest of places, often after patiently biding their time for centuries or even thousands of years. And while the organizers behind most archaeological excavations hope to unearth ancient or prehistoric artifacts, a local project is casting its gaze back a mere 90 years. Thanks to a cryptic passage from the posthumously published biography of Cecil B. DeMille—often considered to be the father of American cinema—the artifacts from a historic movie set from the silent film era have been identified, painstakingly recovered, and are now on display for anyone who can make the trek to the Guadalupe-Nipomo Dunes Center. While the 1956 version of The Ten Commandments with Charlton Heston is a well-known movie, it was actually a remake of DeMille’s earlier, silent version of the epic Biblical story. Unlike the later film, which DeMille shot in Egypt, the silent version used Guadalupe for its scenes depicting the Jews’ now legendary exodus from Egypt led by Moses. The Guadalupe-Nipomo Dunes Center is playing host to the findings of a private excavation; the effort involved several archaeologists, but was spearheaded by filmmaker Peter Brosnan, who’s working on a documentary. Literally decades in the making, the film is about the find and the excavation, with the excavation proving much more challenging than the filming process for a number of fiscal and bureaucratic reasons. A public unveiling of the newly recovered set pieces—which have been conserved by art restoration experts at the Hollywood Heritage Museum—took place at the Guadalupe-Nipomo Dunes Center on June 14. The event was speakeasy themed, celebrating the era in which the historical film was made. Cecil B. DeMille was one of many stage turned-film directors in the early 1900s, helming his first movie in 1913. Just a decade after his initial project, DeMille had become a hugely respected director, garnering countless fans and Hollywood support. RIGGING RAMSES: Famous artist Paul Iribe designed and sculpted the huge statues of the Pharaoh Ramses, which were built on site in the Guadalupe dunes. The genesis of The Ten Commandments was a publicity stunt coordinated by DeMille and the Los Angeles Times, who jointly offered $1,000 to whoever came up with the idea for DeMille’s next epic film. More than one reader suggested the Biblical exodus as a suitable topic for the project, and powerhouse director agreed. An artist of authenticity, DeMille hoped to shoot The Ten Commandments in Egypt—an idea his backers, however, were reticent to fund. The small town of Guadalupe, relatively close to Los Angeles, made more fiscal sense. “Any time a film needed some place that looks like Africa or the Middle East, Guadalupe is a lot more pleasant a place to work than the desert,” said Doug Jenzen, executive director of the Guadalupe-Nipomo Dunes Center. But the Dunes Center isn’t just interested in the afterglow of the Hollywood elite wafting across the crests and valleys of the dunes. The story of The Ten Commandments is also the history of Guadalupe, and the many people who witnessed or participated in the film. “Peter Brosnan collected a lot of oral histories from the old timers out here, which was really forward-thinking of him,” Jenzen said. The resulting tale explores the seemingly unlikely merger of the tiny town of Guadalupe and the machine that was the Hollywood film industry nearly a century ago. Perched atop a sand dune, which is now in the Santa Barbara County Guadalupe-Nipomo Dunes Reserve, the set included a 120-foot-tall, 800-foot-wide facade of the “The City of the Pharaoh,” which required more than 70 miles of cable to keep upright. A group of sphinxes, each of which weighed five tons, flanked an avenue. DeMille’s production employed 1,600 laborers—the majority of whom were locals—to help build the wood frames and concrete and plaster set pieces. The huge sculptures were actually crafted by Paul Iribe, the famous artistic director of Vogue. CLUES FROM THE PAST: Cecil B. DeMille left a lot under the sands of the Guadalupe Dunes, including scraps of set pieces, costumes, and equipment. Once the massive set was finished, DeMille and his crew arrived. With the help of the military, the director had a huge camp built on the sand dune adjacent to where they were filming. It boasted 500 tents for actors, camera operators, lighting technicians, makeup artists, and military members. There was a hospital tent, projection room tent, and even a giant mess tent that could seat up to 1,500 people. 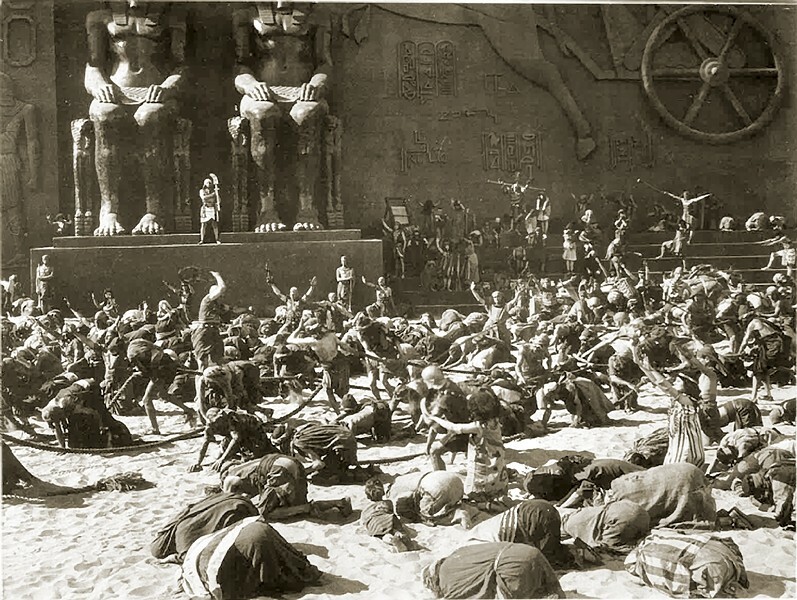 Once he was finally ready to shoot, DeMille called on locals to help fill out his epic exodus scene. The Santa Maria Valley was already a booming agricultural area on the Central Coast, and local ranchers were more than ready to hire out not just themselves as extras, but their animals, too. The exodus scene included 2,500 actors and 3,000 animals. Brosnan has tracked down a number of anecdotes about the production from the old-timers he interviewed in the early ’80s. Some of these ranchers-turned-actors included Ernest Righetti and Clarence Minetti. DeMille, who was famous for his strict rules of conduct on set, also hired a kind of vice police to patrol the tents and make sure there wasn’t any undesirable activity going on. Some of the cultural artifacts recovered include the Prohibition Era “cough syrup” bottles, a clue that perhaps illegal alcohol consumption was some of the behavior DeMille was trying to restrict. The soldiers and crew would come to town often to indulge in activities not sanctioned by DeMille. And, though nobody remembers exactly who was driving the chariots from the film, the reproductions of ancient vehicles were used as practical—and impractical—transport. Once the principle photography requiring the set was finished, DeMille had little use for it. Though he had agreed to remove all of the construction when he first got the permits to film in Santa Barbara County, DeMille wasn’t prepared to ship thousands of tons of concrete, plaster, and the rest back to Hollywood. Unbeknownst to the community and the county permits office, DeMille dynamited the base of the huge Egyptian temple face, which fell backward and was buried. 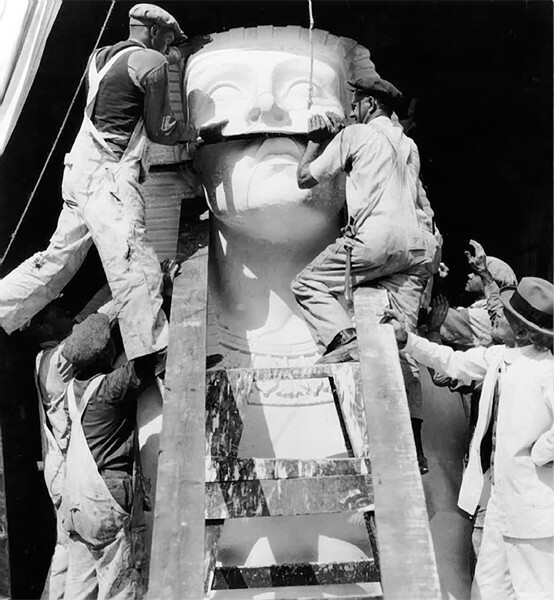 He used an early form of the bulldozer to dig a ditch and push in all 21 of the massive sphinx statues. Piles of garbage and unnecessary items were buried as well, leaving clues as to how the cast and crew lived while making motion picture history on the Guadalupe Dunes. The only clue Cecil B. DeMille left regarding the massive set of The Ten Commandments waiting under the sands of Guadalupe came in his autobiography, which was published posthumously. That small paragraph set a handful of Hollywood film buffs on the trail of the “Lost City of DeMille.” Brosnan, who was involved from the beginning of the project as a documentarian, was one of the first to stand on the site while aware of what rested underneath. In 1983—Brosnan, along with Bruce Cardoza and Richard Eberhardt—traveled to the site, led by local Joe Gray. After digging into the sand, they found the sculpted face of a horse, which they recognized from the wall of the giant set façade. 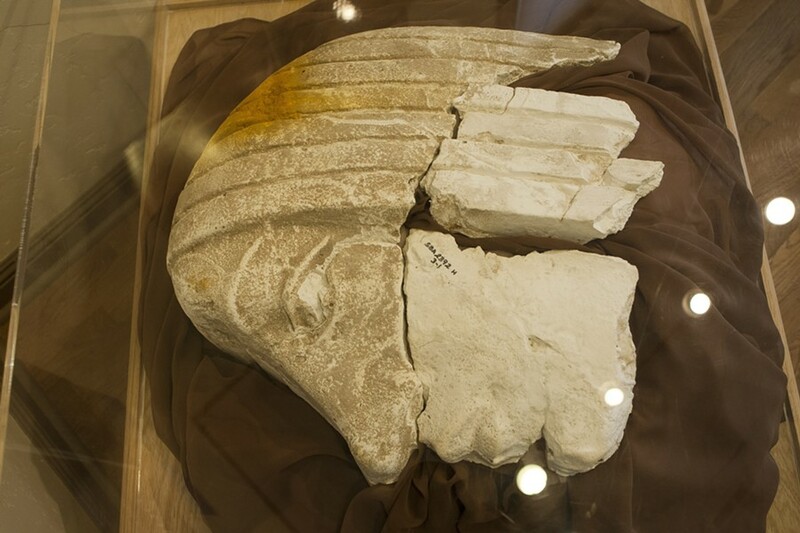 They also began uncovering other plaster pieces and cultural artifacts. Unfortunately, due to a lack of financial support and county permits, the project was deserted, much like the set. After the DeMille family gave Brosnan a grant to digitize the interviews he collected from people involved in the project, interest was piqued. The Los Angeles Times, echoing its early support for DeMille, reported on efforts to uncover the set of The Ten Commandments. This brought Brosnan worldwide attention, including that of a woman in Texas who contacted him and agreed to fund the rest of the project, excavation and film included. Though Brosnan received the financial support he needed, getting permitting and permission was another story. In the early ’90s, with the help of archaeologist D. John Parker, the team was able to use ground-penetrating radar to locate much of the set, without doing any real digging. Once prepared to actually dig, literally one business day before the excavation was set to take place, the Santa Barbara County permitting office rescinded the permit, claiming it had issued the wrong kind of permit, Brosnan explained. snowy plover, an endangered bird that nests on the dunes. Plover season runs from March through the beginning of October—so late that autumn, hoping to beat the winter rains, the team spent two weeks excavating. The sand acted as a natural desiccant, preserving materials used to make the films, including some costume pieces. Unfortunately, when what was once preserved becomes exposed to the wind and moisture in the air, it quickly falls apart. Many of the cultural artifacts are being kept by the Dunes Center on behalf of Santa Barbara County, which technically owns them. The large set pieces recovered by Brosnan have been taken to Los Angeles to the Hollywood Heritage Museum where they’ve being restored for the unveiling on June 14. VIEW THE PAST: The Guadalupe-Nipomo Dunes Center presents “The Lost City of DeMille,” featuring real archaeological remains of the set from the film The Ten Commandments, at the Dunes Center, 1065 Guadalupe St., Guadalupe. The center is open 12-4 p.m. on Wednesday and 10 a.m. to 4 p.m. Thursday through Sunday. Cost is $3. More info: 343-2455, admin@dunescenter.org, or dunescenter.org. The unveiling will be a watermark for Brosnan, but not the last. He hopes to complete the documentary film cataloging the project soon and possibly debut it at the Santa Barbara International Film Festival. Though the excavation unearthed quite a lot of artifacts, it only scratched the surface, Brosnan explained; there’s still quite a lot of the set out there. The Dunes Center’s display capability is limited by what can fit inside its doors, so the larger set pieces remain unrecovered. Though Brosnan is done with his project, other professional groups can apply for permitting from the county to try to excavate the set. Note that members of the general public aren’t allowed to remove any set pieces from the site without facing legal action from the county. The majority of silent era films are lost, Brosnan explained. Not just the films, but also the sets and artifacts used to make them. That’s what makes The Ten Commandments set so special: It’s a well preserved window into a time when the 20th century’s dominant art form was still developing. Brosnan also sees the current project and any possible future iterations as a golden opportunity for Guadalupe and the area’s tourism.